What is Giant Multiplayer Robot? Giant Multiplayer Robot is a multiplayer service for Sid Meier's Civilization V which handles passing your games' save files from player to player. As this happens, Giant Multiplayer Robot can send you notifications for when it's your turn via the website, email, and/or our desktop app. 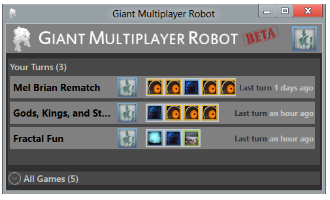 Giant Multiplayer Robot also provides services not normally available in Civilization V hot seat multiplayer, such as leaving an in-progress game, a customizable turn timer, and mod support. The Giant Multiplayer Robot desktop app manages uploading and downloading your save files, so you don't have to worry about it. Alternatively, if you're a Mac user or prefer not to use our desktop app, you can also download and submit your turns via your browser. For free, you can play up to two games at a time. Just log in with your Steam account to get started! (This is how we use your Steam data, if you're curious) If you'd like to be in more games, or if you'd like to help out with our costs, please support us.